We’d love your help. Let us know what’s wrong with this preview of The Promise of Paradise by Andrew Scott. The West has long attracted visionaries and schemers from around the world. And no other region in North America can outstrip British Columbia for the number of utopian or intentional settlement attempts in the past 150 years. Andrew Scott delves into the dramatic stories of these fascinating, but often doomed, communities. From Doukhobor farmers to Finnish coal miners, Qua The West has long attracted visionaries and schemers from around the world. And no other region in North America can outstrip British Columbia for the number of utopian or intentional settlement attempts in the past 150 years. Andrew Scott delves into the dramatic stories of these fascinating, but often doomed, communities. From Doukhobor farmers to Finnish coal miners, Quakers and hippies, many groups have struggled to build idealistic colonies in BC's inspiring landscape. While most discovered hardship, disillusionment and failure, new groups sprang up--and continue to spring up--to take their place. Meet the quick-tempered, slave-driving Madame Zee (partner of the infamous Brother XII), who reportedly beat followers with a riding crop. Hear from Richard "The Troll" Schaller, who founded the Legal Front Commune, General Store and Funny Food Farm on the Sunshine Coast, setting off a storm of hostility from locals. Congregate with Jerry LeBourdais and fellow members of the Ochiltree Organic Commune, who rebelled from hippie communes by embracing meat eating and coffee drinking. To ask other readers questions about The Promise of Paradise, please sign up. 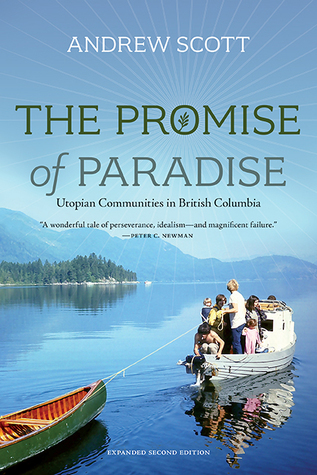 As a lifelong British Columbian I've always been intrigued by the legends of communes, attempts at utopia, and other intentional communities I've heard about growing up. Andrew Scott investigates more than a dozen of them for us, from Brother XII on Decoursey Island to the Emissaries, the Doukhobors, and the Finns at Sointula. Entertaining and enlightening read.